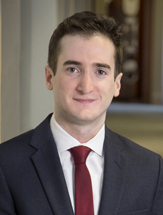 Chad Lennon is an associate who represents both plaintiffs and defendants in various matters in both state and federal courts. Prior to joining the firm, Chad served as a law clerk to the Honorable Beverly B. Martin in the U.S. Court of Appeals for the Eleventh Circuit and to the Honorable Timothy C. Batten, Sr., in the U.S. District Court for the Northern District of Georgia. Before attending law school, Chad worked as a forensic litigation consultant at FTI Consulting. Chad received his law degree from the Emory University School of Law where he was First Honor Graduate, and his Bachelor of Arts degree from Vanderbilt University.